Starting with the basics, we’ll help you make your first breakthrough in learning how to wakeboard. Wakeboarding is fun, lots of fun, but figuring out how to get up on a wakeboard for the first time can sometimes present quite a challenge. With a little patience and a few minutes studying these tips, you’ll be riding the wakes in no time. Before we go into the all details, let’s start with the fundamentals. It's time to wake up and wakeboard, hold on tight! 1. Start floating on your back directly behind the centre of the boat with both feet strapped into the bindings on top of the wakeboard. 2. Keep your knees bent with your elbows tucked in close to your side as you hold the towrope close to the middle of your chest. 3. Make sure the towrope is pulled tight and stretched all the way out between you and the back of the boat. 4. When the boat starts to move, you’ll begin to feel the rope pulling you forward. 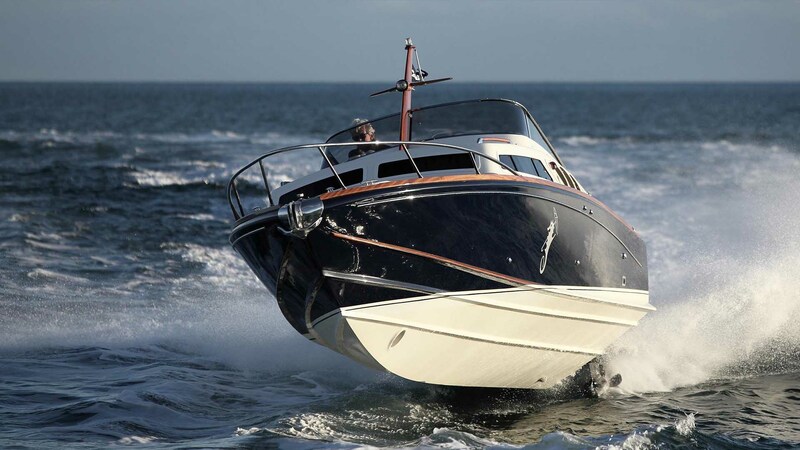 When this happens, slightly apply a little pressure with your feet and allow the boat to do most of the work to pull you into sideways standing position. 5. Once you’re up, keep most of your weight balanced on your back leg as you ride. 6. To steer the board, apply pressure to either your heels or your toes—depending on what direction you’d like to move. 7. After getting comfortable, try steering yourself in and out of the wake. 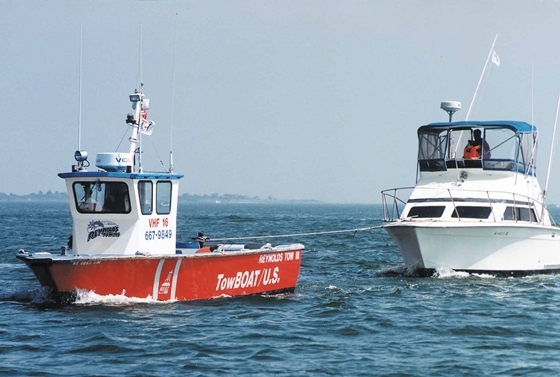 Remember to your keep your knees bent as you move over the wake or as you go through rough areas of water. Just a small switch of the feet, from regular to goofy or vice-versa, can help end your wipeouts and start your ride. Before you jump into wakeboarding, it’s important to be sure of one element: are you regular or goofy? And when we say goofy, we’re not talking about the cartoon character. The terms regular and goofy refer to your preference on how you like to ride—do you ride with your left or right foot forward? If you ride regular, it means that you ride with your left foot forward. If you ride goofy, then you like to ride with your right foot forward. There are a couple different ways to determine whether you ride with a regular or goofy stance. Generally, if you have experience skateboarding or snowboarding, then you may already know what stance you ride with; however, there are rare cases where your stance can vary between the different sports. Another way to determine whether you are regular or goofy is to walk up a staircase. Starting at the bottom, which foot do you use to step up onto the first step? This foot is most likely your back foot. Finally, one last way to determine your stance can be done with the help of a friend—preferably one that you trust. As you stand up straight with your feet relatively close together, ask your friend to stand behind you and give you a gentle shove in the back. Which foot did you move first to catch your balance? That foot would be placed at the back of the wakeboard. As a general rule most wakeboarders who are right-handed tend to ride regular, but that doesn’t mean there aren’t exceptions. While it may seem like something minor, attempting to ride with the wrong foot forward can actually make the process of learning how to wakeboard even more challenging than it already is. So if you feel like you’ve hit a brick wall when you’re first trying to get up on the board, it won’t hurt to test out riding with your other foot forward—it just might make all the difference. 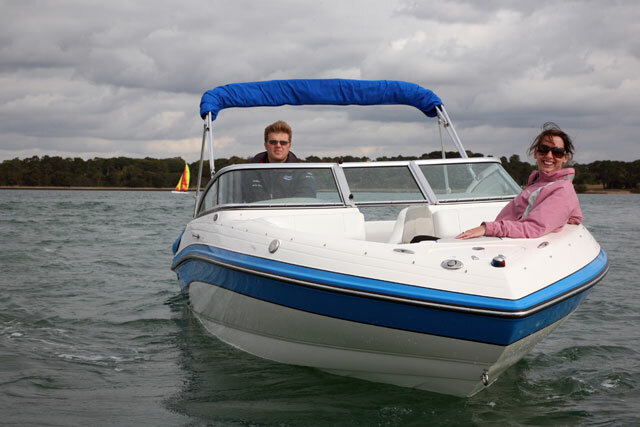 The higher up you're able to attach the towrope to the boat, by using a ski pylon or watersports tower, the better off you are - it'll lead to easier starts and smoother rides. Once you’ve determined your stance, next you should double check that you have the right equipment. Like most watersports, you’ll need four main things: a boat, a towrope, a lifejacket, and of course, a wakeboard. 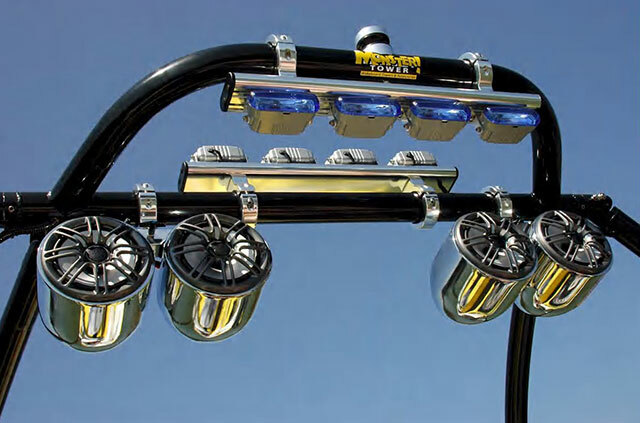 The good news is that it’s possible to wakeboard behind almost any kind of boat—a bowrider, runabout and even a pontoon—although using a tow-boat that’s specifically designed for watersports can definitely make the process a lot better thanks to the added ballast capacity and the addition of a tow pylon or ski tower. Regardless of what style boat you’re on, using a shorter rope can also make huge difference when you’re first learning to wakeboard. While longer towropes will still do the trick, shorter ropes don’t move up and down in the wind or slap the water as much, which can throw off a rider’s balance. A towrope measuring about 45 to 50ft is a good length to start off with for beginners. When it comes to life jackets (also known as PFDs, or “personal floatation devices”), there’s no need to be picky. 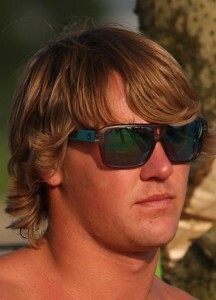 Any standard PFD will work great for wakeboarding as long as it fulfills its purpose: to keep you afloat. You have the option of the standard front zip style life jacket, or if you’d like to take the extra step towards extreme comfortable, there are pullover style PFDs that are specifically designed for wakeboarding and other watersports. 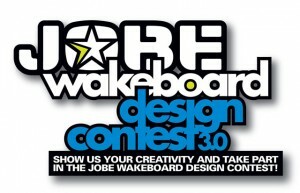 Finally, it’s also important to make sure that you’re using the right size board for your weight and skill level. 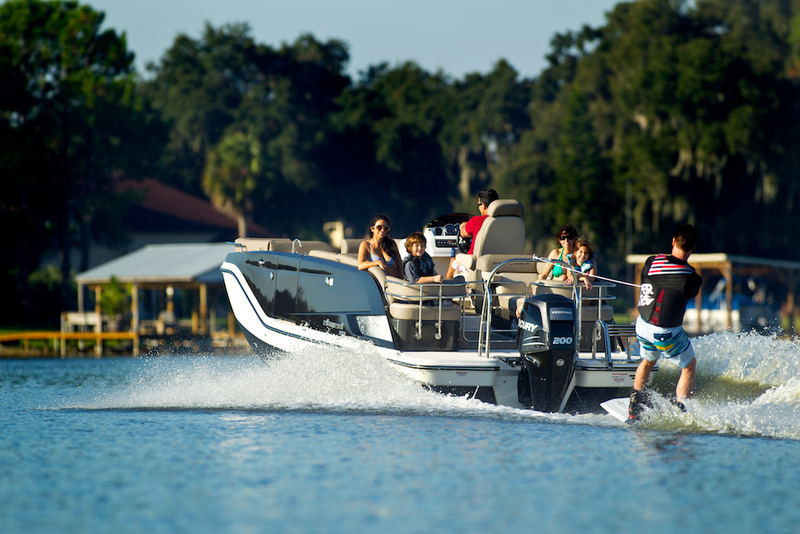 Longer wakeboards tend to be easier to ride on and are ideal for new riders, while shorter wakeboards are slower but easier to spin and perform tricks as you flip or jump across the wake. Your weight is also a factor when determining what size board you should use. Take a look at the chart below to find the right length for your weight class. 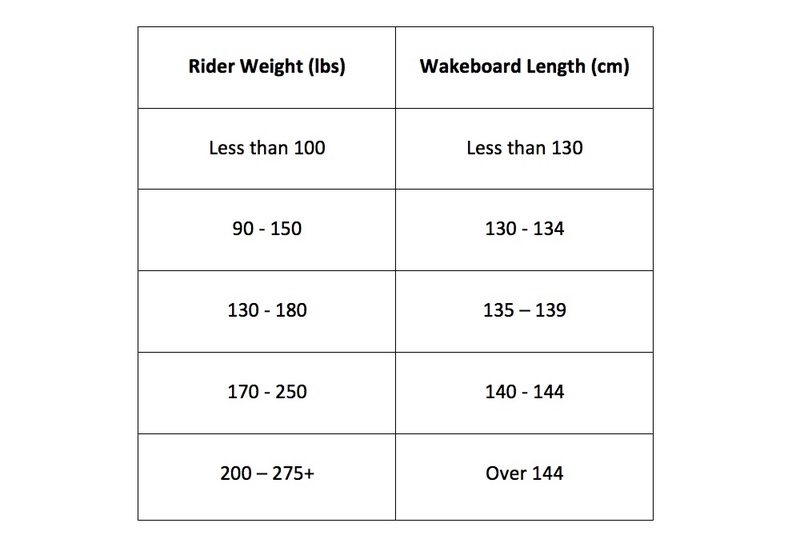 There are many different sizes of wakeboards on the market, so it's important to take into account your weight and skill level when deciding on the right size for you. 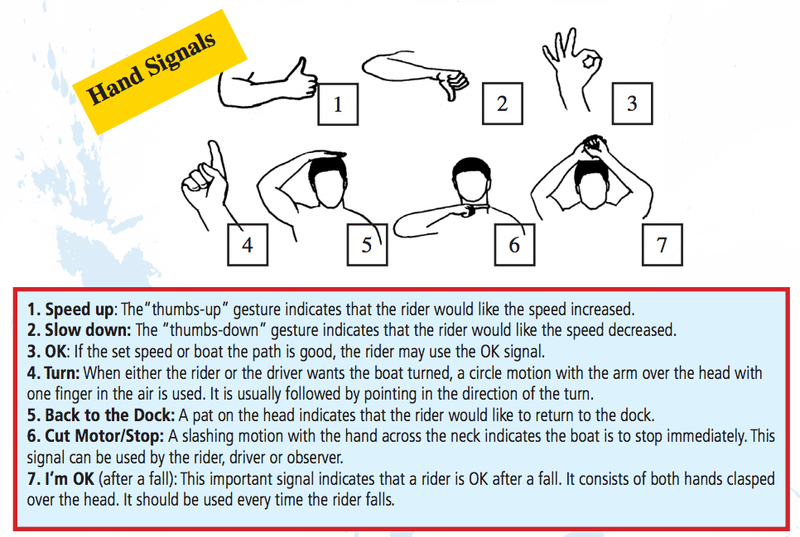 Hand signals play a crucial role in communication between the wakeboarder, driver, and spotter. 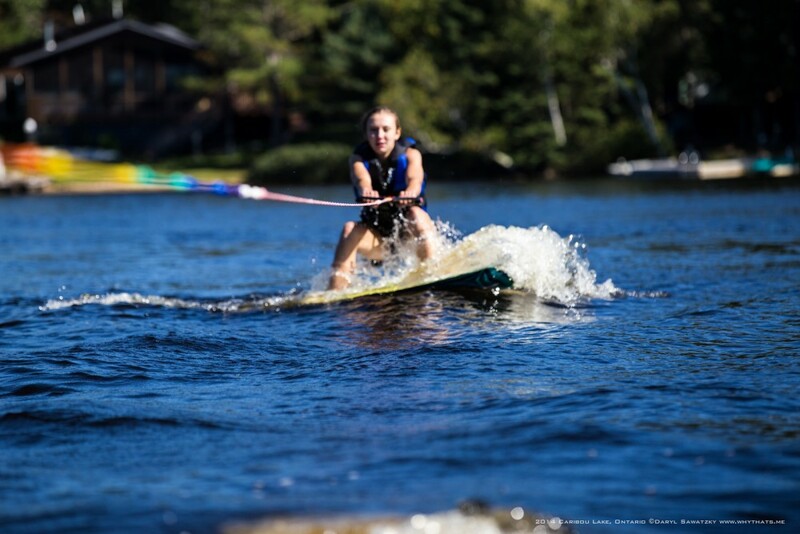 Take a look at USA Water Ski's breakdown of the seven main hand signals used for watersports. If you’re all stocked up with correct gear, then it’s time to jump in and get going. Talk to your driver and spotter before you start to set up hand signals you can use to communicate while you’re being towed behind the boat. Generally a “thumbs up” means go faster, while a “thumbs down” means slow down. Moving your hand across your neck means that you’re done with your ride and you want to stop. If your driver has never pulled someone on a wakeboard before then it’s also important to talk to him or her about speed. To start off, the driver should gradually increase the speed of the boat until you’ll able to fully get up on the board. 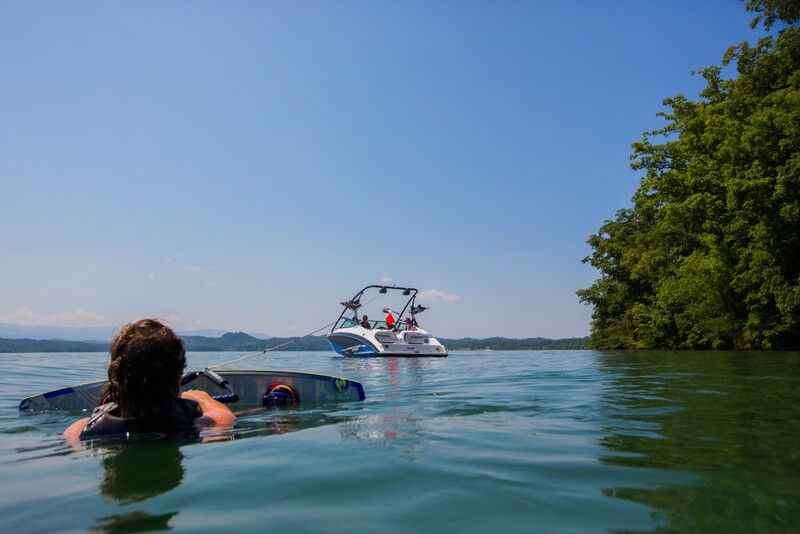 Even after you’re up, they should keep the boat moving at a speed that you feel comfortable - going too fast can make wakeboarding very difficult, especially for newbies. A good rule of thumb is to keep the speed around 16-20 MPH. Once your driver and spotter are all set, you’re ready to ride. As you build your confidence, test your skills by trying a few tricks such as small jumps or a move called carving, which is a sharp turn outside the wake that gives off a spray of water behind the board. Wakeboarding is just one of many sports in an extensive watersports line-up, read more in our features Engine-free thrills: 7 top watersports and Watersports: towable boat toys.